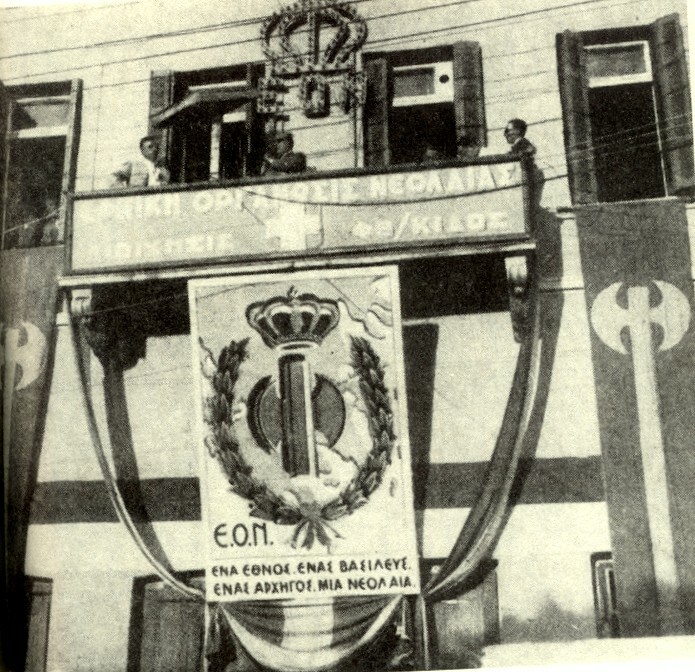 The National Youth Organisation (Greek: Εθνική Οργάνωσις Νεολαίας, Ethnikí Orgánosis Neoléas, EON) was a youth organization in Greece during the years of the Metaxas Regime (1936–1941), established by the regime with the stated goals of helping the youth in the productive spending of their free time and cultivating their national values and cooperative spirit. It disbanded with the start of the German occupation of Greece when some of its former members created the secret occupation resistance/liberation organizations "National Youth Commity" and—the strictly female—"SPITHA" under the leadership of Metaxa's daughter Lucia Metaxa. Membership was not mandatory, and—unlike most contemporary political youth organizations in Europe—EON was not affiliated with a political party, but there was widespread successful campaigning by the regime to include the largest part of the youth to EON, and later took over the scouts and other such organizations, although typically membership still remained strictly voluntary. Some of the activities that EON members were involved in included athletics events, parades and marches, military training, reforestations, recycling. The official -monthly- magazine of EON was The Youth (Greek: Η Νεολαία). The emblem of EON was a labrys surrounded by laurel wreaths and topped with a royal crown, while the flag of EON was similar to the flag of Greece—featuring a white cross on a blue fiend—with the emblem of EON charged in the center in gold and the royal crown moved to the upper hoist side quadrant. The motto of EON was "One Nation, One King, One Leader, One Youth". This page was last modified on 25 December 2015, at 12:28.